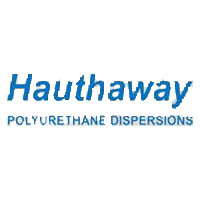 Hauthaway Corporation is an innovative designer of polyurethane polymers and compounded finishing materials for applications like coatings, adhesives and graphic arts. With their strong research capability and experienced applications support, they continually endeavor to meet the challenges faced by formulators and end-users in a variety of industries, including automotive, biomedical, construction, maintenance, and textile. This company was started in 1897 and is located in Lynne, MA. NMP (HD series)containing dispersions that include soft, medium and hard finishes. These products can be used as is or combined with acrylics. Perfect for heat and room temperature cure systems. Co solvent free dispersions are available as well. Hauthaway is also known for PUD systems that include specified modifiers like flatting agents and UV inhibitors.